In the past, every time I’ve undertaken a ROM hacking project i have ended up with a cluster of binary files all at varying stages of usefulness. This simple program is how I will now be working with binary file hacking. The format of the changes is really simple and can all be put together in a text file or in the program itself. As you can see, comments are supported. 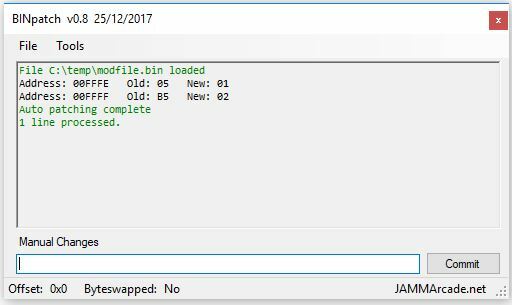 Using this I can comment the changes I make and just ‘Autopatch’ a binary file after I’m finished and if I make a mistake then I can modify the text file and reapply to the original binary. I understand that the way I approach things is not necessarily the way most other people approach things but it might be of some use to someone else out there. The software has a simple HEX viewer in it, can byteswap the loaded binary and also supply an offset. The offset is relatively untested and is intended to be used if you are loading a ROM file that normally starts at, for example, address $1000 in memory space. You can apply the offset and write values to the correct addresses. If in doubt then just avoid this altogether as it will cause problems and cant really do any error checking. Cool. It’s very similar to the tool I included with the Sega Enhanced set to patch OutRun and the other titles, aside from that does a few custom operations like patching the checksums for test mode, ROM interleaving and a few other things.